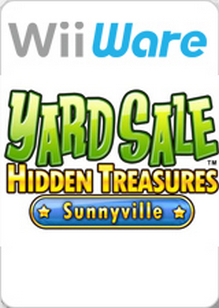 Yard Sale Hidden Treasures: Sunnyville was delisted on Nintendo Wii sometime after May 20, 2014. The game was included in the Nintendo Wi-Fi Connection service discontinuation announcement and would have been available to buy up to this point and presumably for some time after. The game may also have been delisted due to Konami’s purchase of Hudson Soft. “Search local yard sales for hundreds of hidden treasures! Enjoy nonstop challenges in this expansive game!